Over the past decade, Vembu has been versatile in complying to the various requirements of customers. Vembu offered Subscription License for its flagship offering, Vembu BDR Suite and now, we have come up with Perpetual Licensing as well. The reason behind the same was due to multiple requests from various spheres and also in an attempt to comply with business continuity policies of all types of organizations. Vembu’s Perpetual License entitles the customer to use the software indefinitely. Generally, one year of Technical support and Product Updates are included in the Perpetual license. Even after the expiry of the one year maintenance period, the product continues to work but to receive further Technical Support and Software updates, the customer needs to purchase the Annual Support and Upgrade plan. To experience the Support and Updates, the customer is charged the Annual Maintenance Cost (AMC) which is 20% of the original license price. The Customer can either choose to continue with the same version of the software or can pay the AMC and switch to the new update of the software. There are no penalties if there is a lapse for a while to pay the AMC for getting Updates and Support since it is customer’s choice to go with or without the new updates. Since the purchase of Vembu’s Perpetual License is a Long-term investment by our customers, we continually increase our value in an unprecedented way. 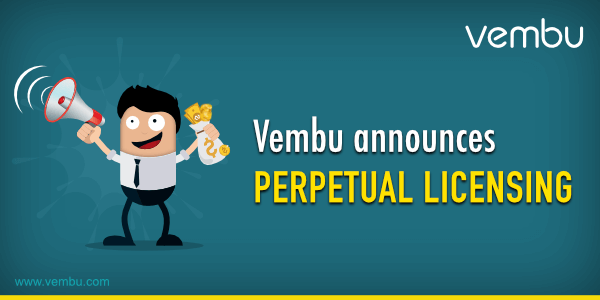 Thus, our customers can now opt for Perpetual License by paying the initial cost and can use the software endlessly plus paying the AMC will allow them to entitle all the updates and support from Vembu. Ultimately, this will lead to customers having considerable savings over-time. Not to forget that Vembu offers one of the most comprehensive free editions in the market, Vembu BDR Suite Free Edition. Thus once the trial period is over, an user can opt for the free edition else if the form requires a proper business continuity plan, Vembu offers multiple and flexible pricing options. Now with the addition of Perpetual licensing, a firm can design their business continuity plan without any hassles.